For the last month I have been living in a nursing home. No, I did not eat the brain of someone who lived in the UK between 1980-1996 and have developed the dementia associated with prion disease (touch wood). This barely-converted nursing home represents my University’s accommodation for me and other students in Ballarat, where I am currently doing a five-week placement. Despite the grimness that confronts me every day upon waking, as well as weather that makes Melbourne look like the Gold Coast, the town of Ballarat itself is really quite nice. Churches and historic buildings densely populate the town centre and the black swans inhabiting the glorious Lake Wendouree are a sight to behold on a rare sunny day. Madame Phở-pas came to visit for a week and provided as good a reason as any to wake up early and seek out some semi-rural muesli. The first place we tried, Eclectic Tastes, looked very promising however we were shocked to our Melbourne-bred cores to discover that on this mid-week morning it was due to open at 9am. What sort of rationale is that? Disheartened and confused, we drove around the Lake looking for anywhere that would feed us. We found Racers Bar and Cafe, which sits on the corner of Wendouree Parade and Webster Street. The inside is not particularly inspiring, with a lifelessly modern decor consisting of lots of red, white and black. Glass dominated the facade which did give the place an open, airy feel. This thirds approach to presentation was particularly appealing, except for the subliminal peace promotion that I suppose I can get behind. 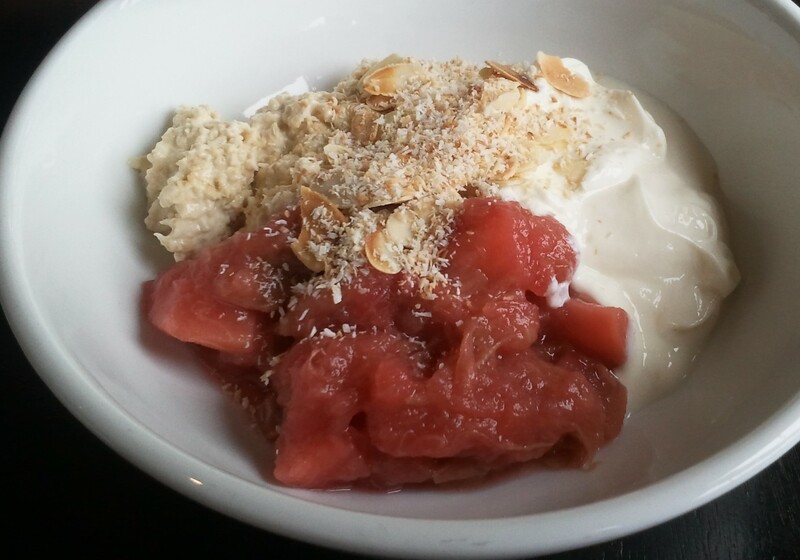 To start, a good thing about this dish was the rhubarb and probably-pear stewed mixture which provided a tartness that balanced the almost caramel, naughty sweetness of the honey used. The nut crumble added a crinkliness to the texture that was welcome as that muesli mix itself did not seem to contain any sort of nut or seed. Indeed, the paste-like oats did not stand up own their own and had to be quickly combined with the two other thirds to be enjoyable. The whole of this muesli was certainly tastier than the sum of its parts. Overall: The Racers offering is a good example of a second-choice muesli. Don’t jump at the chance to try it, but if your first option is unavailable and you still need your morning cereal this muesli will tide you over until lunch.